When I think of a poet laureate, the image of an ancient bearded Greek with a wreath of laurel on his head comes to mind. The tradition was revived in Italy in the 14th century. Nowadays, some twenty countries and eighteen US states have poet laureates. Wikipedia says that the laureate “is a poet officially appointed by a government or conferring institution, typically expected to compose poems for special events and occasions”. In the UK the appointment is made is made by the monarch on the advice of the prime minister. The role does not entail any specific duties, but there is an expectation that the holder will write verse for significant national occasions. The position dates from 1668 when John Dryden was appointed by Charles II. Traditionally, in addition to a financial stipend the appointee received a quantity of good wine. The current UK poet laureate is Carol Ann Duffy, who was appointed in 2009 for a fixed ten year term. Her compensation is £5,750 and a barrel of sherry. 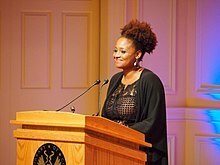 In the United States, the Library of Congress appoints a ‘Poet Laureate Consultant in Poetry to the Library of Congress’ annually. The laureate receives a stipend of $35,000 per year, serves from October to May, and is given the responsibility of overseeing an ongoing series of poetry readings and lectures at the library, and a charge to promote poetry. No other duties are specified. The current laureate is Tracy K Smith, who in April, 2018 was nominated for a second term by the librarian. Ms Smith, born in 1972, is a graduate of Harvard and Columbia Universities, has published three collections of poetry, and is currently professor of creative writing at Princeton. Her poetry collection Life on Mars won the Pulitzer Prize for Poetry in 2011. Ms Smith strikes me as a person I would like to sit and talk with about the creative process and how she teaches it. She is clearly quite an accomplished artist at a relatively young age, and I particularly like her answer to why poetry matters today, because, I think the same answer applies to literature, generally.